One Pork Spare Rib on a Bed of Kimchi, Served with a Side of Peas. For dinner one night, I thought I'd go back to the principle and actually mix kimchi with Western foods. I had a pork spare rib from the night before, so I decided to fry it up and lay it on a some chopped up kimchi, like you would eat German sausage on sauerkraut. First, I had to chop up the kmichi in to small pieces like I did for the kimchi hotdogs. For that, I used my scissors-in-the-jar technique! This one isn't about kimchi (because I ran out, actually), but I have been eating two famous Korean confectionery products. They are Choco Pie by Orion Confectionery and 몽쉘 (pronounced similar to mong shell but the packaging is all in Korean) by Lotte Confectionery. They are round, cake filled sweets with semi-hard chocolate on the outside so you can hold it. Both products are similar in size and shape, but different in filling and texture. Because it's nearly Christmas time, I thought I'd try brandy (!) flavoured custard with chopped up Choco Pie and 몽쉘. 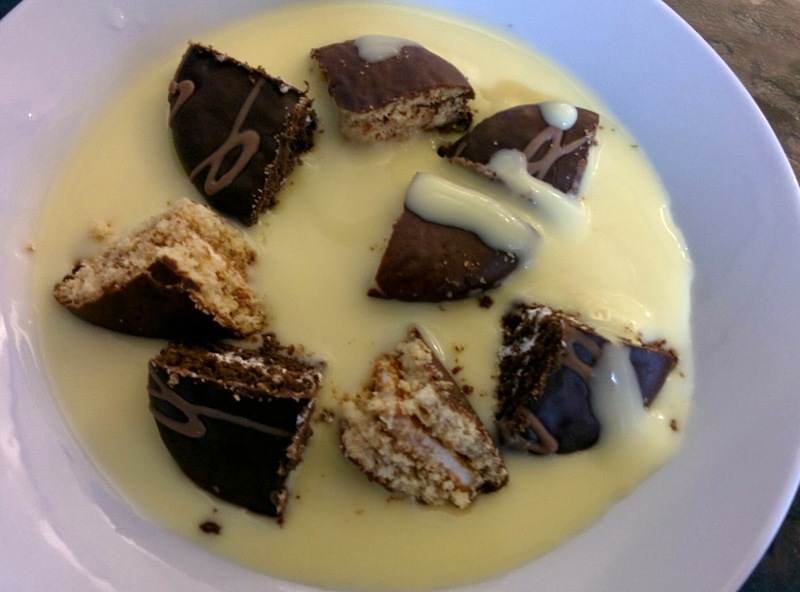 It worked really well together - the custard on the spoon with a chunk of the cake snack provided some contrast to the slightly dry cakes, and combining the two products in the one dessert provided a little variation between each spoonful! The Choco Pie actually has a slight vanilla taste, with a plain cake and marsh mellow. The 몽쉘 is actually chocolate cake with a cream centre. It is decorated on the outer shell with chocolate sauce where as the Choco Pie's outer shell is just plain. I think next time I'd like to add actual brandy (this just contained flavouring) or even try it with (finely chopped though) ice cream instead.